Thank you all for entering my giveaway. 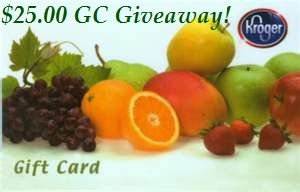 And a big thanks to General Mills, Kroger and MyBlogSpark for sponsoring this giveaway! The winner chosen by Random.org was……. Congrats Linda! I know the $25.00 will help pay for some of those grandbaby needs! On another note, tomorrow I will be going on vacation! Every year at this time we go camping at a State Campground with a bunch of family and friends. We have been doing this get together for about 25 years now. Every year we choose a new to all of us State campground and meet up for a big party long weekend. There are generally about 15-20 campsites reserved. A lot of the family and friends live all over the state so, this is the only time we get together each year. Everyone has a great time. This year’s campground is Harrisville State Park. This campground is right on Lake Huron. A beach is mandatory when we pick out a campground each year. I will be gone for almost two weeks. A week at the above campground and a week at the campground we normally stay it. I won’t have internet pretty much the entire time! GASP!! So, I won’t be able to do any visiting anyone. However, I have scheduled some posts. I have my “Thrifty Things Friday” party posts all ready and scheduled to be posted. So, the party will go on! And this coming Thrifty Things Friday party will include another giveaway! And this coming Saturday is Thrifty Tablescape Monthly Party! I have that post already scheduled as well! So, I hope you will be back to link up! Congratulations, Linda!! Happy shopping to you. Have a wonderful vacation, Diann! We know you will spoil the family with your winnings. Get yourself some cheesecake or chocolate. Diann, don't forget the bug spray and candles. I think you are in for another warm week or two. Yay for Linda. Enjoy your camping trip, Diann.